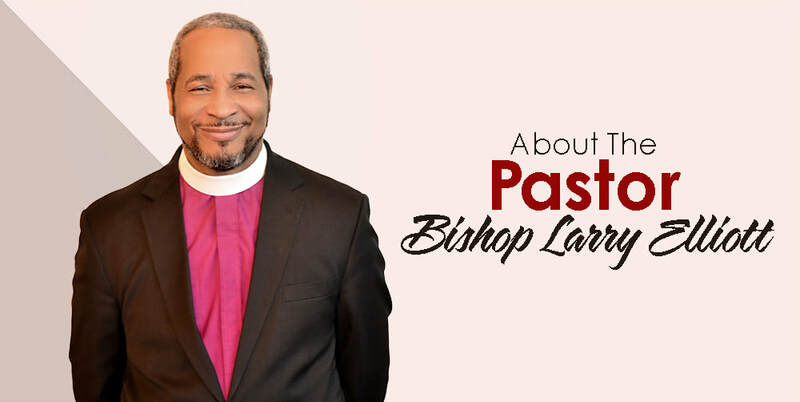 Bishop Larry Elliott was born the fifth of 10 children, on May 15, 1952 in Southampton County, Virginia to Mr. And Mrs. Lloyd Elliott. He was the first of the children to attend college, thereby inspiring his brothers and sisters to further their education. He received his Bachelor of Science Degree in Accounting from Norfolk State University in 1974. He has known his wife Brenda for 48 years and has been married 40 years. They have been blessed with 7 daughters, 8 grandsons and 9 granddaughters. As a child growing up, Bishop Elliott summarizes his life as happy, sad, angry, abused and oftentimes humiliated because of sickness, race and family life. He recalls always knowing, even as a child, that all men were created equal, but could not understand the reason why so many thought that wasn’t so. I couldn’t understand my Father’s alcoholism and weekly abuse of our Mother. I couldn’t understand why a child could be so abused and humiliated by their peers because of sickness and being different. who knew him to also be changed. Since being called into the ministry 38 years ago Bishop Elliott has served the Bible Way Organization as Deacon, Young People President, Evangelist, Elder, Pastor, District Elder and the National Director of Finance. He now serves as the Pastor of Bible Way Church of Our Lord Jesus Christ, Incorporated of Meriden, Diocese Bishop for the New England Diocese Bible Way Churches, a member of the Executive Board of Bishops and National Treasurer. Bishop Elliott also served as an Office Manager for an African American owned supermarket in New Haven, Connecticut, was Chief Fiscal Officer and temporary Director of the Greater New Haven Inner City Day Care Council, accountant and bookkeeper for Junta for Progressive Action and Fair Haven Parents’ Ministry, managed a Golden Skillet Restaurant in Virginia for 3 years and a general accountant for ABCD, Inc in Bridgeport, Ct. Tragedy caused his Executive Director to move him from his position to being Director of Energy and Weatherization Services. This, of course, placed him in the social service field. Later, he was hired at the Meriden Community Action Agency with the same position. When New Opportunities, Inc. assumed the responsibility for the Community Action Agency Bishop Elliott remained, eventually being made Director of New Opportunities of Greater Meriden. Bishop Elliott say’s, this is the Lord’s doing and it is marvelous in his eyes. in the Body of Christ by being born again of the water and of the Spirit.